1. How did this journey for Advait began? Was it a chance? Initially, I had planned to go to the base camp alone but Advait insisted on joining me. I told him that he could join if he managed to train and prepare for it. For the next month, his training included climbing 100 floors daily. 2. Being a mountaineer yourself what do you think about this journey of Advait? For an adult, this is usually an incredible feat, with not just the mountain trails to deal with but also the thin air, reduction in atmospheric oxygen and subzero temperatures dropping to about 8 to -12 degrees C at times. But for young adventurers of this age, this truly a surreal achievement. 3. Is he involved in any other activity apart from mountaineering? He is actively involved in other sports like football, swimming, martial arts and plays multiple musical instruments like violin, piano, and table. He speaks multiple foreign languages and youngest certified child to write Mandarin. 4. As far as you can remember what was the most heart enduring moment for Advait? The thing that Advait enjoyed the most was that he was able to do something so tough, so he felt a sense of accomplishment. While he was there, he commented that you can’t capture this beauty in a camera. His favorite moment was when once he was answering nature’s call and he actually looked up to find a Himalayan barking deer over his head, so he felt very very excited and I think its left a permanent indelible mark in his head. 5. 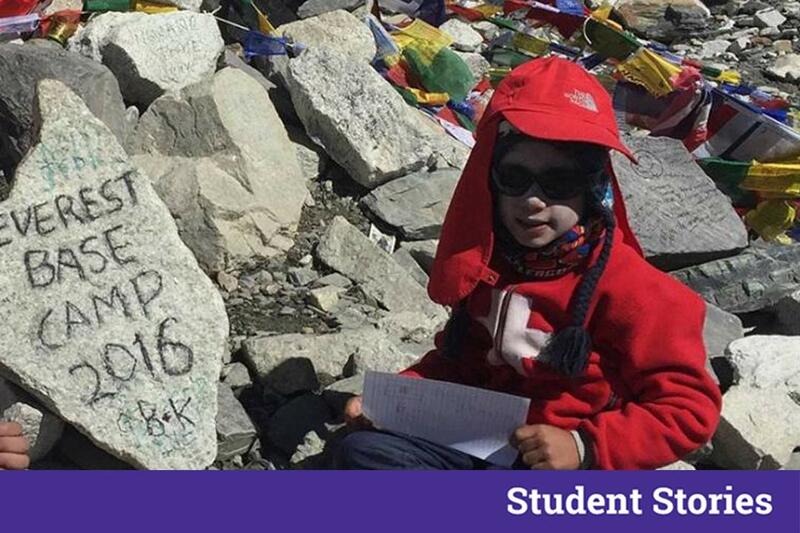 What was the toughest memory of Advait’s climb to the base camp? The thing that Advait found toughest was the breathing part, because as adults we know to breathe in through the nose and out through the mouth but Advait had it tough. He was left panting often. He had to learn how to breathe in through his nose and out through his mouth. Then at night, sometimes he would feel suffocated but he had the maturity to sit up and stay calm, and take deep breaths. He also used to feel very thirsty at night. And I think on the seventh or the eight day I told him not to wake me up and he picked up his mug and put it to his mouth in the middle of the night and he realized there is no water coming. He touched it and it had frozen. So then he held it inside his sleeping bag and waited till it melted and then he had it. So that was very mature on his part to have done that. 6. What has Advait and the family planned next to conquer? Advait has long-term plans to return to Everest and attempt the climb to the summit. In the meantime, he has set his sights on the only slightly less ambitious targets of summiting Mt Kilimanjaro in Tanzania and Mt Elbrus in Russia. Work is all about dedication, Writing is all about expression and Life is merely an imitation. Do read my articles!